Finally got around to writing a new post (I attempted one earlier but the PC crashed and lost it!) As Ellee reminded me its now 5 weeks since I posted which is some sort of record in my 6 years of blogging. I thought I would do a quick round up of the year. 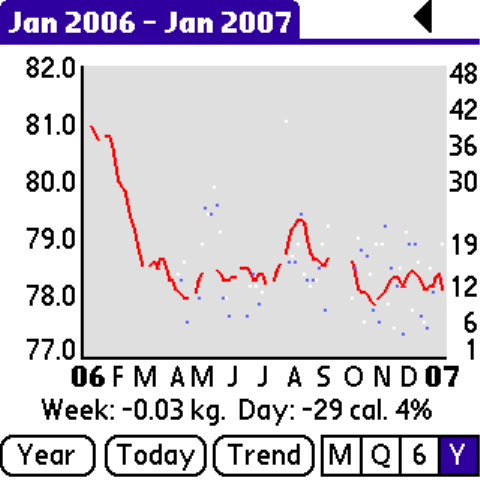 Here is the year according to my Eatwatch chart ( A Program that made the transition from the Treo650 to the Treo680 nearly intact) . I've finally made it to my target of 78kg set 2 years ago. As you can see the oscillations in weight are getting less as my self control is beginning to improve. The worse peak in August is what happens when you stay on a small island with good food and precious little else to do! 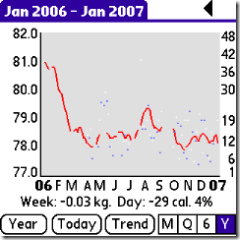 (Note that the graph is computed from daily weighing's. The blue dots are Km walked. A great year for my walking. Firstly doing The Pennine Way in 15days at the end of April/May. taking just over half million steps compared to the million steps from St Jean Pierre Port to Santiago de Compostella. Then in September for 23 days I crossed the Alps walking the GR5 around 356 miles. and of cause just recently I've met Sally in Norfolk. So in the last couple of months we have been doing many walks in East Anglia. 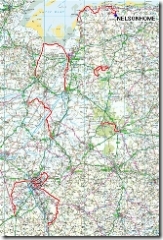 Here is a rather neat map with all the GPS data from the walks superimposed on it. Will be interesting to see what 2007 will bring. My guesstimate for 2006 is over 1000miles of walking. Bit worried about the !000 mileage for 2007, how will i fit it all in. Bonne et heureuse année Geoff. Good luck for your 1000 miles quest. Geoff can never sit still for 5 minutes. Have a great year, a great hols in Les Gets with Sally. Geoff made my year, btw, by introducing me to blogging. My Treo is in a RESET LOOP! How do I stop it?